How one becomes God? God is not manufactured by vote. There are definition who is God. God must be the proprietor of all the riches. Aisvaryasya samagrasya. Samagra means all. Nobody can compete with Him. Here, in this world, material world, I am rich man, and there is another rich man who can compete with me. There is another rich man who can compete with him. But nobody can compete with God in richness. That is one qualification of God. Nobody can say that “I am richer than God.” You can say “I am richer than Ford or Rockefeller” or this or that. You can say. So similarly, the other qualification, nobody can be stronger than God, nobody can be wiser than God, nobody can be more beautiful than God, and nobody can be more renouncer than God. So she said, “Oh, I am Your wife. Married wife. So I must go even if You go to hell.” This is ideal wife. She could have refused: “Oh, Your father has ordered to go to forest. You can go. I shall go to my father’s house or I shall remain here.” No. This is ideal wife. She must be prepared to accept any circumstances of the husband. Not that when the husband is rich the wife is very faithful, and when he has come down to be poor or he’s going to forest the wife gives up his company. No. Wife means better half. She must abide. Just like, it is said, just like a shadow follows the reality, similarly, the wife is the shadow of the husband. Wherever the husband goes, she must go. Whatever the husband wants, she must carry out. Of course, in this country this interpretation is taken differently, that wife is made a slave. But actually, it is not so. When Sita was kidnapped in the jungle, Ramacandra expected that, that she was beautiful, she was young, and “We shall be in open jungle. It may be some demons may come,” and actually it so happened. So for Sita, Lord Ramacandra massacred the whole family of Ravana. Only for Sita. So as the husband, so the wife. The wife was so faithful that she could not remain alone. She must accompany the husband even in the forest. And the husband was so faithful that, “Oh, my wife has been kidnapped.” So He massacred the whole family of Ravana. So these are ideal history how… Ramacandra, Lord Ramacandra appeared on this world to educate or to place ideal example of a king. How the king should be. Therefore when there is good government… The example is given, Rama-rajya. 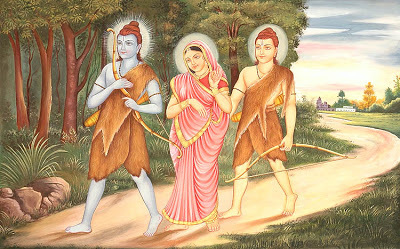 Rama- rajya. It is the kingdom of Lord Rama. Because everyone was happy, everyone. There are so many instances in the life of Ramacandra. One brahmana… Not brahmana exactly. Somebody came to Ramacandra. Because at that time there was no court like this, that you have to go to a court and apply with stamp fee. Then your judgment will be delivered after six years. It is not like that. Anyone who has got some complaint, he should… The king used to sit in the open audience, and the citizens were allowed to approach the king and place their complaints. Because there was no complaint practically. Everyone was happy. Very minor complaint. So somebody came to Ramacandra, and he charged Ramacandra, “My dear king, my son has died. How is that, in the presence of his father, son can die? There must be something wrong in Your government.” Just see. The charge is “Why my son has died before my death? This is unnatural.” So there was nothing unnatural. The king was responsible even for severe cold, severe heat. That we get from history of Srimad-Bhagavatam. That is stated. So the kings were so much responsible. They were always thinking of the happiness of the citizens, and the citizens were also so nice. One citizen approached Lord Ramacandra and His next assistant, His brother, Lakshmana, informed Him that “He is a brahmana. You were absent on Your tour for, I think for a fortnight or a month, and this brahmana has not eaten even a drop of water during Your absence.” Why? “Because he comes here to see You, darsana.” Just like we come here in the temple to see the Deity. So Lord Ramacandra was present personally. So he used to come. After seeing Ramacandra, offering his obeisances, then he would go home and take something, his breakfast. That was his vow. And because he could not see for a fortnight or a month Lord Ramacandra because He was out on political tour, he did not eat even. Just see. The citizens were similar to the king. So at that time, there was a statue of Ramacandra which was being worshiped in the family from Maharaja Ikshvaku. Maharaja Ikshvaku, the son of Manu, happens to be the forefather of the family in which Ramacandra appeared. So he was devotee of Lord Rama, and he was worshiping the statue of Lord Rama. So that statue was being worshiped by the family one after another. But when Ramacandra was actually present He kept that statue in the closet of the room, and when this brahmana approached and Ramacandra was informed by Lakshmana that he is so steady and strong in his vow, so Ramacandra ordered that he may be delivered that statue so that in My absence he can offer respect to the statue and do with this. That form, I mean to say, statue, or arca of Ramacandra is still existing in South India. It is being worshiped from that time. So these were the dealings of Ramacandra. Then He, His younger brother Lakshmana and His wife went to the forest, and His wife was kidnapped by the diplomacy of the demon Ravana, and there was fight between Rama and Ravana. Ravana was very, materialistically, he was very strong. But the thing is for fighting with Ravana, Ramacandra did not come back to His kingdom and take His army. No. He did not come back because He was ordered to live in the forest. So He organized army with the jungle animals, the monkeys. The monkeys. He fought with Ravana, an organized materialist, with the monkeys. You have seen the picture. And He constructed a bridge between India’s last point to the other side. Ceylon is considered to be the kingdom of Ravana. So there was a bridge, and the stones were floating. So there are so many historical incidences in the life of Ramacandra, and we should remember, because if we remember why we are observing today fasting for Ramacandra… There were many kings like Ramacandra. Because the kings were trained in that way. Maharaja Yudhishthira was also as good as Ramacandra, and Maharaja Parikshit was as good. There were many such kings. But we are not concerned because He was a king. He is the King of all kings, paramesvara. Because He is God, therefore we are observing today. Ramadi-murtishu kala-niyamena tishthan [Bs. 5.39]. So He is not original form of God. The original form of God is Krishna, and Krishna expands Himself in various other forms. Advaitam acyutam anadim ananta-rupam [Bs. 5.33]. Ananta-rupam means millions and millions. The Manu is also incarnation of Krishna. So in one day of Brahma there are fourteen Manus. So Brahma lives for one hundred years. Just see how many incarnation of Manus are there even for one Brahma, and there are innumerable Brahmas also. So, as stated in the Srimad-Bhagavatam that nobody can count how many incarnations are there, but some of the chief incarnations are mentioned, and Lord Ramacandra is one of them. So Lord Ramacandra, He killed Ravana and He installed his brother. Bharata, He was so faithful brother, He replied, “No. You are king. So long You are living, nobody can be king. So I cannot be king.” Then He requested, “At least You administer.” Because after the departure of Lord Ramacandra, Maharaja Dasaratha died out of the shock because Ramacandra was very pet son, eldest son. He was going to be king, and by his order He was sent to the forest. The father could not tolerate the shock. He died. So Ramacandra’s life, God’s activities, pastimes, if we hear, that means we are associating with Ramacandra. There is no difference between His form, His name, His pastimes, and Himself. He’s absolute. Therefore either you chant the holy name of Rama or you see the statue of Rama or you talk of His pastimes, transcendental pastimes, everything, that means you are associating with the Supreme Personality of Godhead. So we take advantage of these days when the incarnation of God appears or disappears, and we try to associate with Him. By His association we become purified. Our process is purification. 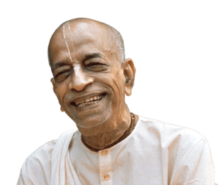 Krishna consciousness means simply we are purifying our consciousness. From the birth, as I have explained, everyone is sudra. Sudra means one who laments. That is called sudra. For a slight loss or slight inconvenience, one who laments, he is called sudra. And brahmana means one who tolerates. A sudra has no toleration. So kalau sudra sambhava. Kalau means… This age is called Kali. So it is the statement of the sastras that in this age the whole population is sudra.